Designer’s own personal restoration of one of the famous architect Paul Williams designs, this property is located in the center of Hancock Park. A beautiful hedge surrounds the property with an entryway in the center enhanced with luscious trees on both sides. A lovely stone pathway surrounded by flowers and trees lead up to the doorway. The lawn is artificial with fiber optic lighting and timed irrigation systems in the planted beds. The spacious property is 3,544 square feet and is listed for $2.5 million. The house has a center hall plan, with a formal foyer that leads to the living room, dining room, and family room. 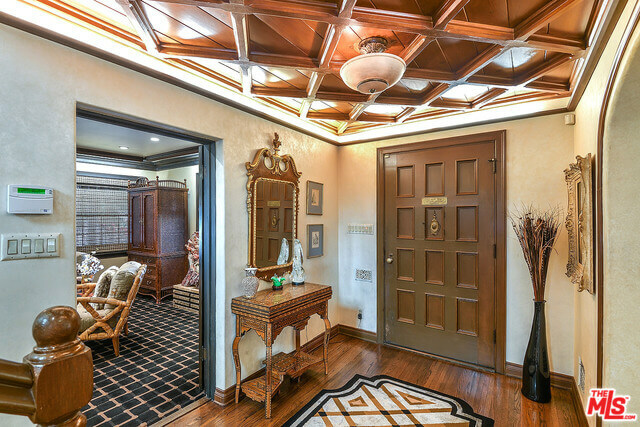 The formal foyer welcomes the guest with gorgeous criss-cross wooden ceilings, which continues onto the living room with exposed wooden details on the ceiling. Adjacent to the dining room, the kitchen boasts of its high-end stone countertops and luxurious Wolf + SubZero + Miele appliances. 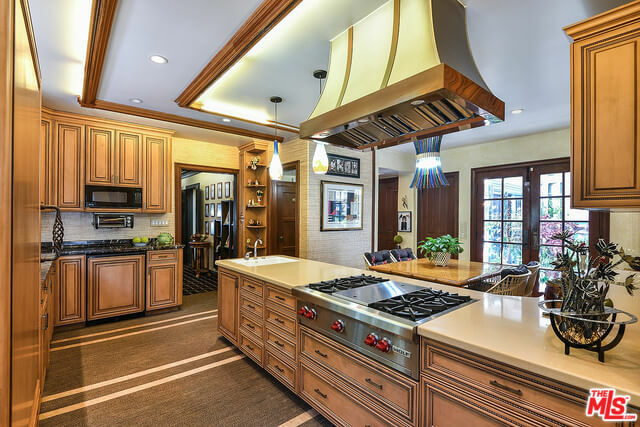 In addition, there is a breakfast area and a large walk in pantry. Right off the kitchen, there is an extra room with a half bath that could be used as an office or maid space. On the upper level, there are 3 bedrooms and 2 bathrooms. The master bedroom features high ceilings, spacious closet, and ensuite bathroom, which highlights a custom onyx bath and a separate shower similar to a Mediterranean haven! 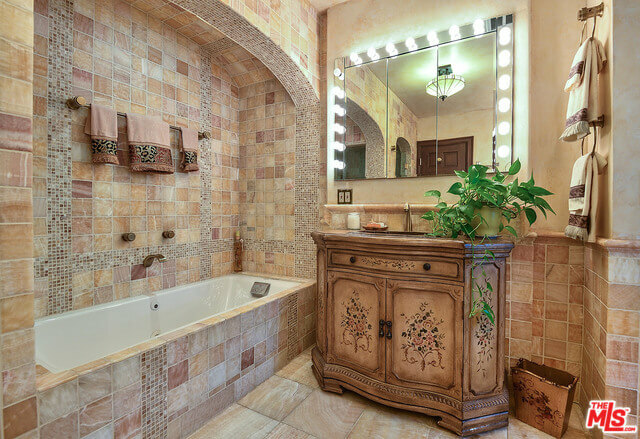 The second bath spotlights a shower with a steam and multiple shower heads. In addition, the laundry room is also located upstairs. Not only does the interior provide a luxurious living style, the backyard is just as appealing. The backyard features a pergola that overlooks the koi pond and artificial grass— green always and saving the environment! The garage has been converted to an office with a sink, central AC, and a large window that opens up to the pond. In addition, there is an attic space above the garage for extra storage or any personal space desired, choose your design! Designed with love and care, unique millwork are displayed in each room and rich hardwood floors layout in some spaces. All the electrical and plumbing are updated and there is an elaborate lighting system along with recessed lighting. The attic is insulated and the glass windows are beveled. 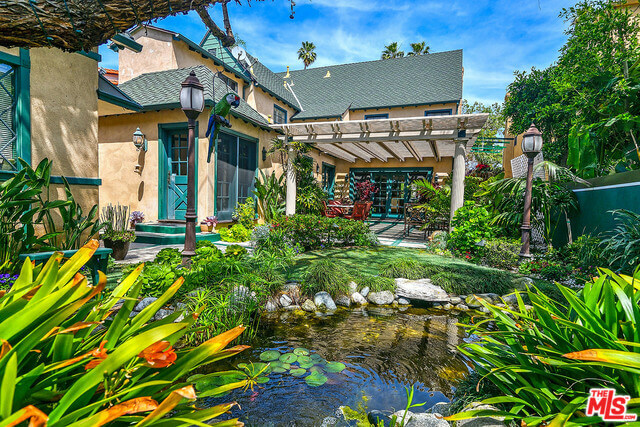 Within the Third Street School District and Grove Mall or Larchmont just a drive down, the location is prime. This house encapsulates a home built and designed with love. At the Bienstock Group, we love working with our clients to sell their properties with utmost care and interest. 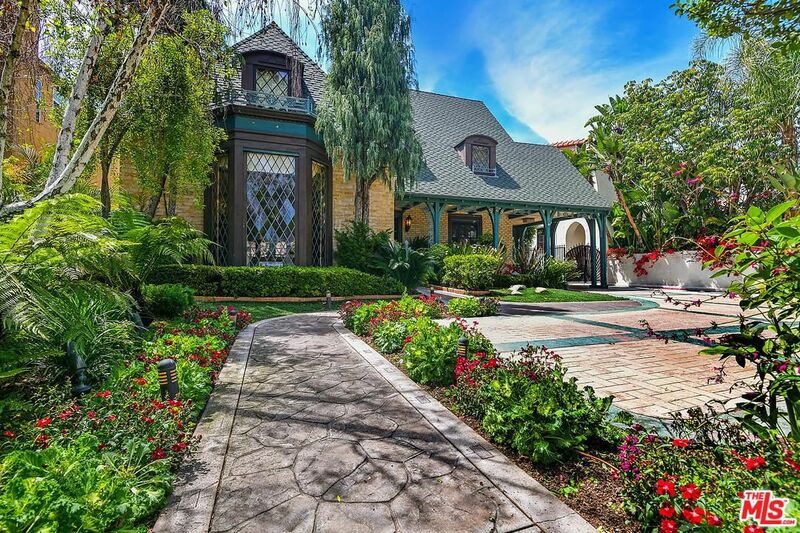 Please feel free to reach out to us for more information about Los Angeles homes for sale in Hancock Park, Larchmont Village, Beverly Grove, Windsor Square and Miracle Mile!